Knowledgeable Support Techs and Fast Shipping. 40 Years Experience. Get Answers Now! 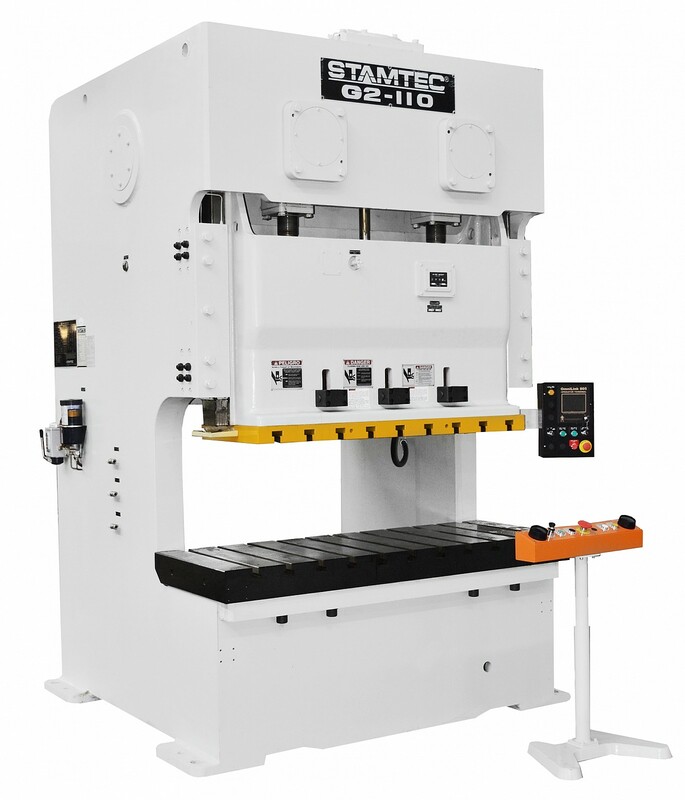 The Stamtec OCP mechanical press one-point gap frame press (a.k.a. 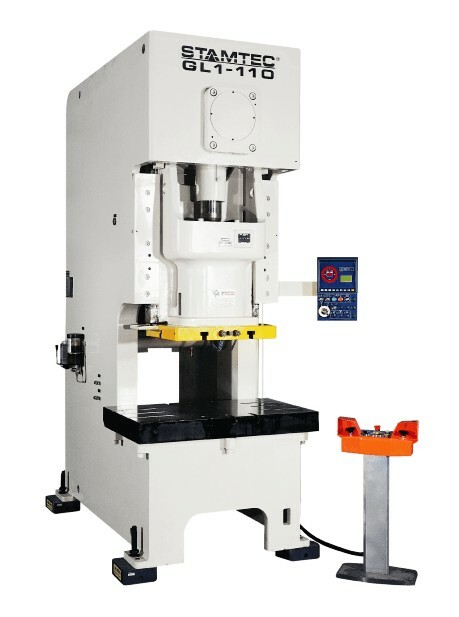 OBG, OBS, OBI, or C-frame) is designed for stamping small parts at high single-stroking rates or in continuous mode, using either blanks or coil stock. The OCP metal stamping press provides all the features you expect to find in a world-class press, at a very competitive price, backed by a three-year (calendar-based) warranty without limitation. 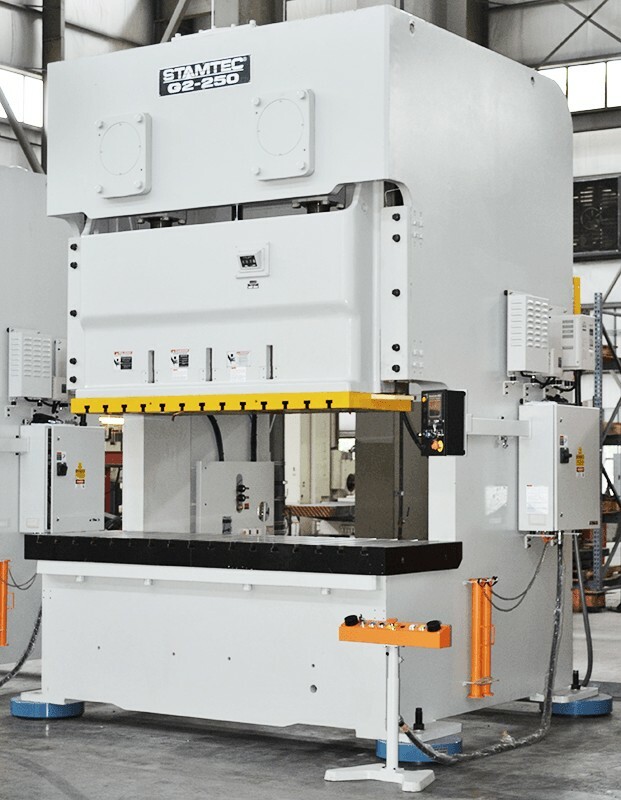 Review the specs and advantages of our OCP mechanical presses Series gap frame press below, and then contact us for assistance in identifying the right mechanical press for your application. 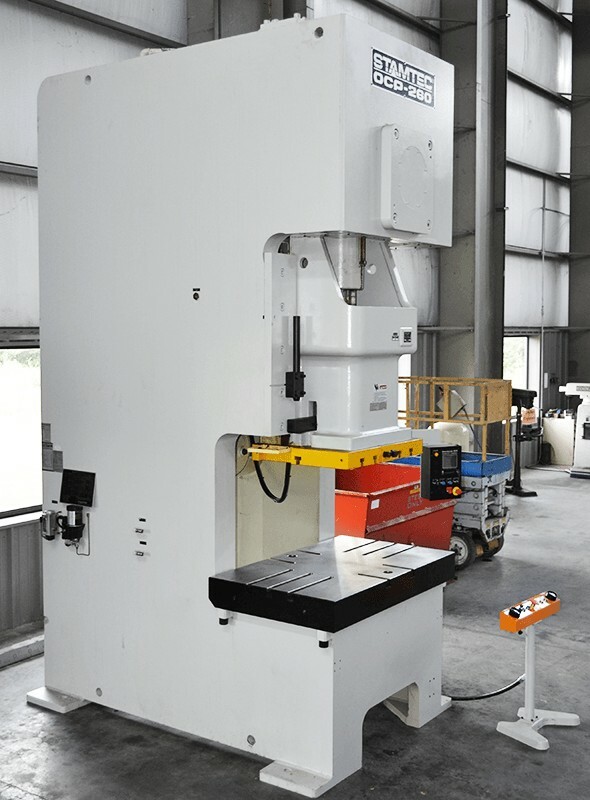 Stamtec stamping press machines can be customized to meet a wider range of SPM, stroke, rating point (BDC), bed and other specifications and dimensions. Heavy, one-piece welded steel frame is designed to resist deflection, providing more accurate stampings and longer die life. Fast-response hydraulic overload relieves the pressure of a tonnage overload in milliseconds, stopping the press immediately and protecting press and dies from damage. Extra-long gibs provide excellent control of slide alignment and accuracy throughout the entire stroke. Slide comes equipped with a removable, steel, T-slotted die-mounting plate for easy modification, repair or replacement. Wet clutch and brake provide long life, very low maintenance, and high performance even at high single-stroking rates. Press controls from industry leaders like Wintriss, Link, Helm (Allen-Bradley), Toledo (Allen-Bradley), Siemens, Mitsubishi, etc. 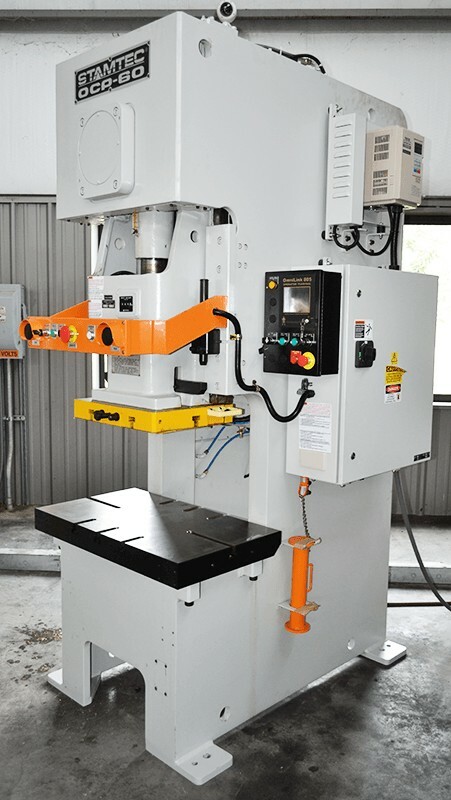 The Stamtec G2 series mechanical press two-point gap frame press (a.k.a. OBG, OBS, OBI, or C-frame) is designed for stamping relatively long, narrow parts at high single-stroking rates or in continuous mode, using either blanks or coil stock. The G2 series mechanical press provides a large die area at a very economical price and can run progressive dies that need the longer bed area. The slide on these metal stamping presses is guided by six-point, full-length box type gibs, providing excellent control of slide alignment and accuracy throughout the entire stroke. 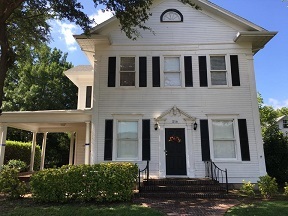 Read the specs and press advantages below to learn more and then contact us by calling 931-393-5050 or submitting this online form for help identifying the gap frame press you need. 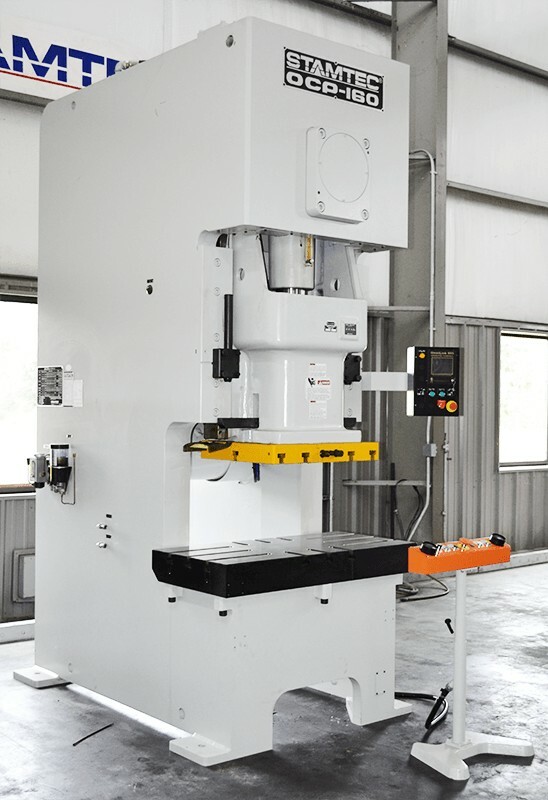 A Stamtec mechanical press can be customized to meet a wider range of SPM, stroke, rating point (BDC), bed and other specifications and dimensions. Extra-long, box-type centered gibs guide the slide during the working portion of the stroke. The design of this mechanical press stamping machine provides full control of left-to-right and front-to-back slide alignment. Heavy, one-piece welded steel frame is fully stress relieved and designed to resist deflection, providing more accurate stampings and longer die life. 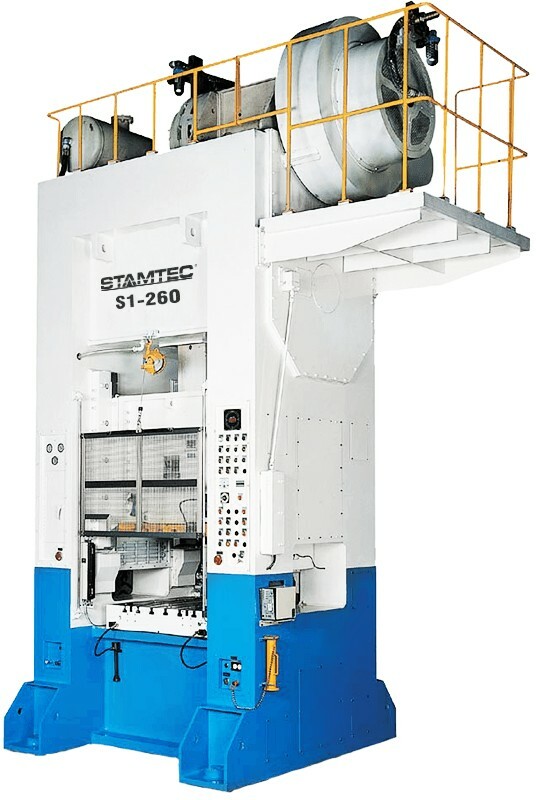 The Stamtec S1 straight side press (a.k.a. 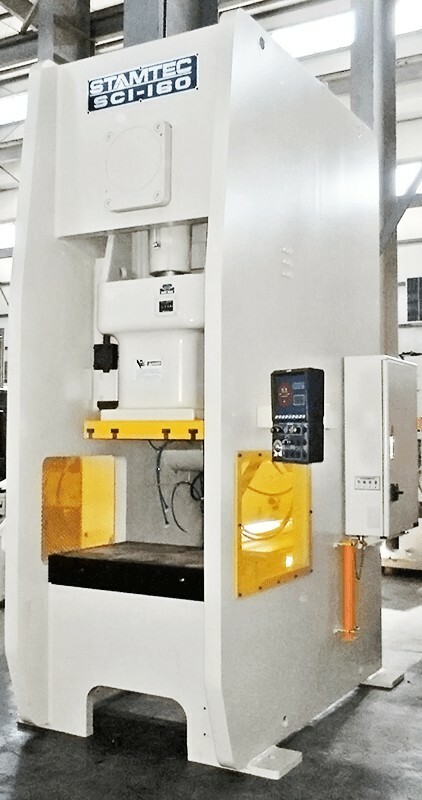 single crank press) is designed for stamping small parts that require high tonnage, high flywheel energy, maximum frame and bed rigidity, or some combination thereof. The path of the slide on this mechanical press is guided by eight full-length, ninety-degree gibs with nickel-bronze wear plates, offering maximum control, a high degree of accuracy and ease of adjustment. 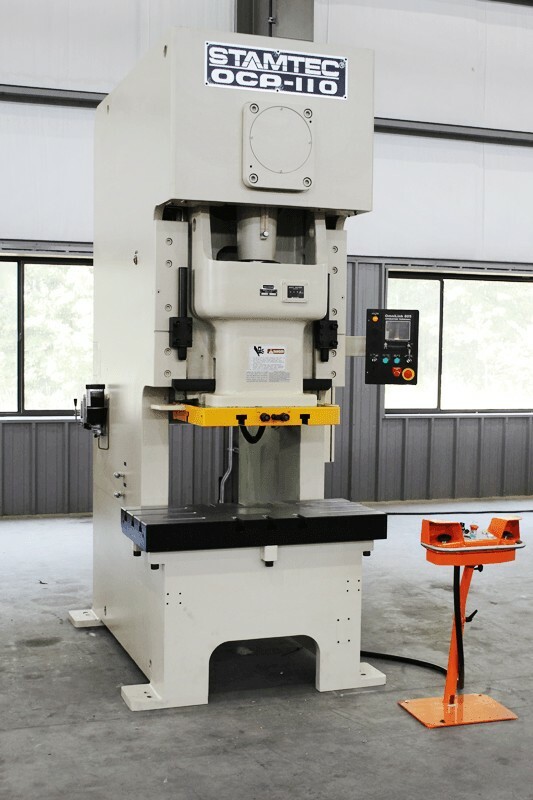 The S1 straight side press can be custom-built to the customer’s specifications, considering all variables to best match the application, production requirements, equipment budget, etc. View the press features and advantages below, and then contact us by calling 931-393-5050 or submitting this online form for more information on our S1 Series Straight Side mechanical press . 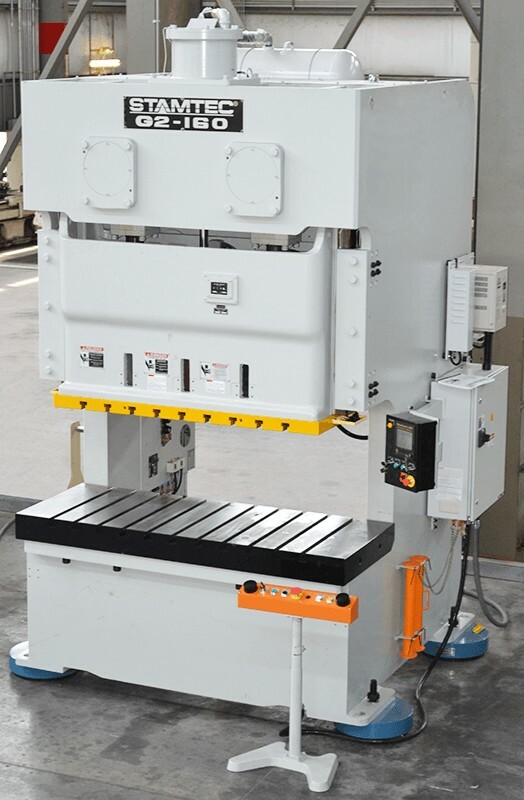 This mechanical press series offers many features standard that are only available as options on other machines. Fast-response hydraulic overload relieves the pressure of a tonnage overload in milliseconds, stopping the mechanical press immediately and protecting press and dies from damage. Knowledgeable support techs available now. Call Coleman Machinery for Pricing.